Pumpkin Spice Crunch Cake is a dessert that gives pumpkin pie a run for the money. I think it is better than pie – by far! More texture, more flavor, better looking. However, everyone is entitled to their opinion and Wheels and Bytes certainly have theirs. They lean a little toward pie. But they are not known to turn down dessert of any kind, so asking them defeats the purpose. Try it for yourself and see what you think. Scrumptiousness! I like the spice crust and the spice strudel topping. Actually, they improve with time, especially the crust. That makes this the perfect bake ahead dessert. Keep it covered in the refrigerator for a day or two. Then bring it to room temperature before serving to bring out all the flavor. A good vanilla ice cream is the perfect accompaniment, but real whipped cream is certainly a runner up. Whipped topping works, too. Your choice. For potlucks, serving it plain is best. No worry about melting or mess and the taste is still phenomenal! A dump cake is super easy to make. This isn’t a true dump cake because you mix the crust and topping, but it goes together almost as quick and easy as dumping the ingredients together. Be sure to use plain pumpkin puree. You can use canned pumpkin – stock up at Thanksgiving time because that’s when the prices are lowest. OR you can use homemade pumpkin puree. Here’s how we turned our Halloween pumpkin into puree one year. You’d need 3 1/3 cups of homemade puree to equal the 29 ounce can. 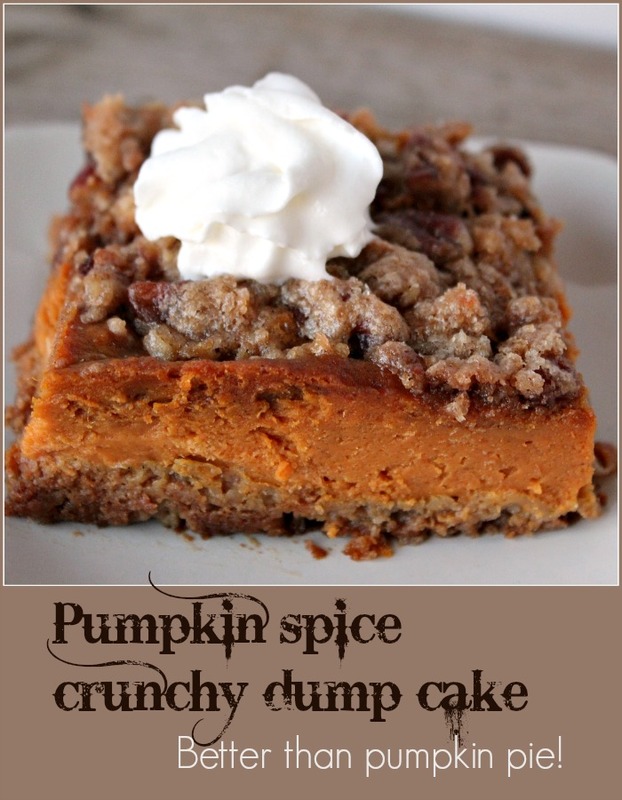 Full of spicy pumpkin goodness with a crunchy topping, this is better than pumpkin pie. Preheat oven to 350 degrees. Spray bottom of 9 by 13 pan with cooking spray. Combine cake mix, less the reserved 1 cup, and ½ cup butter. Mix until crumbly, then add egg. Press mix evenly into bottom of 9x13 pan. Place in oven while mixing the filling, about 5 minutes. Mix eggs and pumpkin puree together. Add spices and sugars, then evaporated milk. Stir together well. Spread filling evenly over the partially baked crust. Place sugar and cake mix in medium bowl, cut in butter until crumbly. Stir in pecans and coconut, then sprinkle evenly over the pumpkin filling. Looks really yummi! I am going to save this for later!